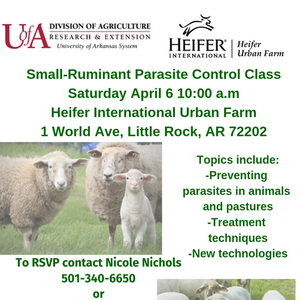 Come learn about controlling and preventing parasites in small-ruminants at Heifer International Urban Village and Farm on April 6th. Please call Nicole at 501-340-6650 with any questions or to RSVP! The Pulaski County Cooperative Extension Service is part of the University of Arkansas System Division of Agriculture. We provide educational programs and research based information to the people of Pulaski County.